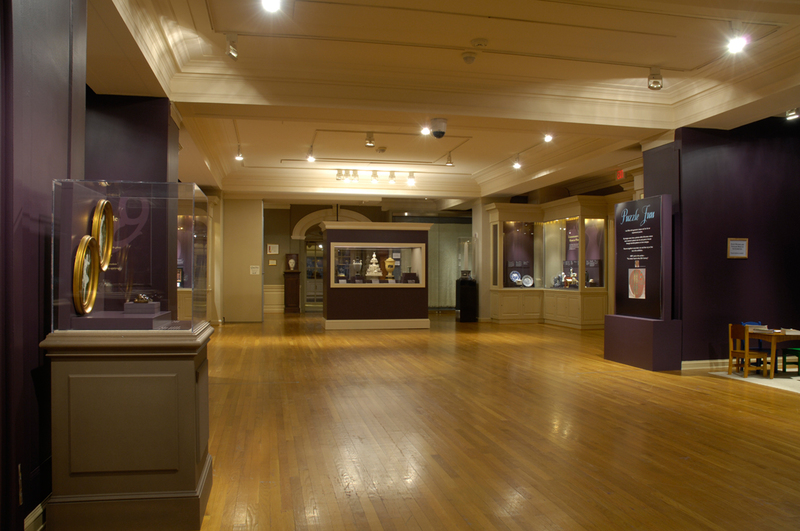 The newly renovated Museum Gallery is spacious, bright and modern, but what was the gallery like before these changes? How has the exhibition of the collection evolved over the years? While a collection of souvenirs of the Revolution was envisioned from the beginning of the organization, its permanent home has moved, grown, and improved. At first, items donated to the Society were kept in the rooms that the Society rented for offices in downtown Washington, DC. After 1896, they were temporarily stored at the Smithsonian Institution. When Memorial Continental Hall was completed in 1910, the first museum gallery occupied an area on the south side of Memorial Continental Hall. This room, now the O’Byrne Gallery, had large glass cases for items in the collection. The need for more room to display the collection prompted an expansion into the former library space on the D Street side of Memorial Continental Hall. This North Gallery presented the growing collection of household items and furniture, including the sofa owned by Thomas McKean, a signer of the Declaration of Independence. By doubling museum space, the additional gallery helped accommodate the collection items that returned from the Smithsonian Institution in 1931. With the completion of the Administration Building in 1950, the museum finally achieved a space built specifically for it. The new museum gallery contained a case dedicated to Caroline Scott Harrison holding her paintings, White House china, and a mannequin wearing her dress. 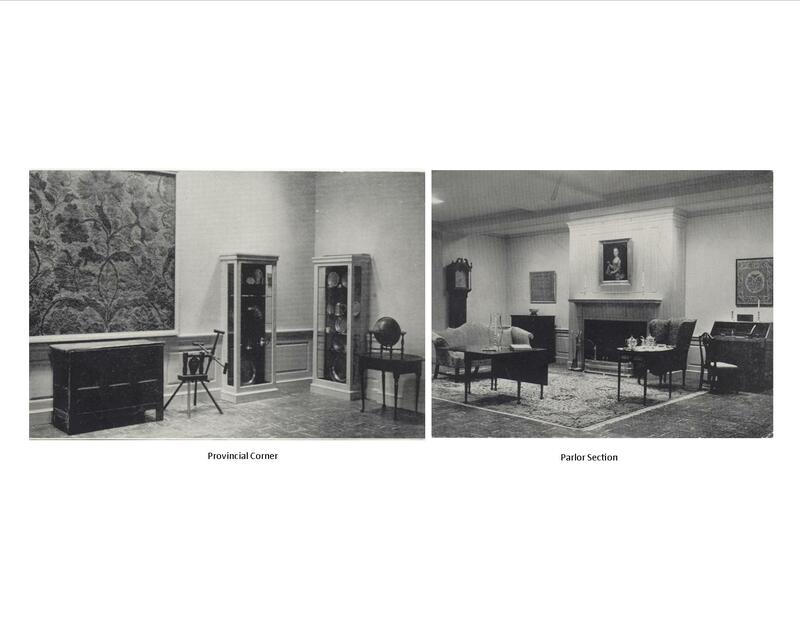 The Provincial Corner displayed a survey of decorative arts found in early America and the Parlor Section exhibited 18th century paintings and furniture, including the Thomas McKean sofa. 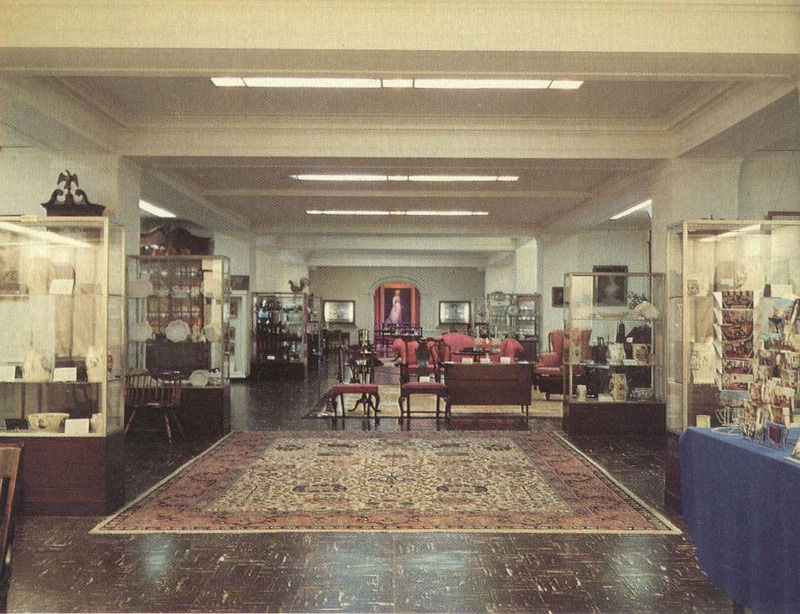 In the 1960s and 1970s, the gallery continued to exhibit as much of the collection as possible using a variety of display cases and arranging furniture in groupings throughout the gallery. Thematic exhibitions as well as a redesign of the permanent displays began in the mid-1970s. By 1987, the gallery needed an update. New oak flooring replaced dated black linoleum tile and partitions, added in the middle of the gallery, created flexible areas for special exhibitions. The gallery hosted A Few of Our Favorite Things, an exhibition using a selection of recent accessions to the museum collection. 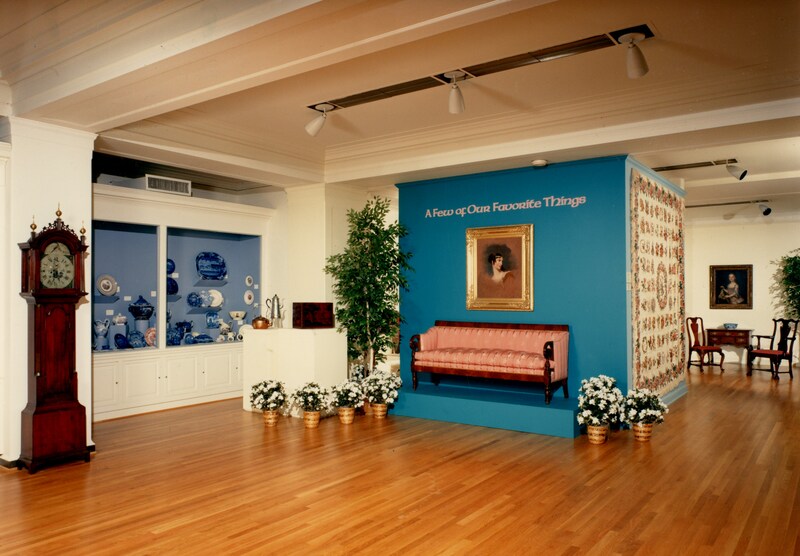 In the front of the gallery, wall cases displaying ceramics were organized into chronological arrangements of ceramic wares made in America, England, France and China. At the rear of the gallery, wall cases displayed silver and American glass, grouped by how the items were used, and two alcoves were designated for changing displays of recent accessions and textiles. A 1990 update added modern track lighting and converted the back alcoves into a quilt display area. The 2018 renovation dramatically transformed the gallery’s appearance as well as function. Removing several walls and the built-in display cases enlarged the gallery. A herringbone patterned wood floor, digital lighting system, and a glass partition created a modern gallery that blends with the traditional design of the building. It is now divided into two distinct areas. In the new Study Gallery, cases and drawers designed for close examination of rotating groups of collection objects replaced the wall cases with static exhibits. A glass partition separates the Study Gallery from space used for thematic exhibitions in the larger Main Gallery. Despite all these changes, one early display has come back to the gallery. The McKean sofa returned and now resides in the Study Gallery. Thanks to all of our generous donors for have supported these Museum Gallery projects through the years. We hope you'll visit the DAR Museum soon to see this new space for yourself! #TBT 125 years ago, on April 19, 1894, the Sequoia Chapter in San Francisco, California, planted a �... 18 hours 43 min ago.